Day 6, California. Sandy stops at an overlook in Inyo National Forest after a close call with a bear in Yosemite. It was the last day she wore a hydration pack; the longer she ran, the less she wanted to carry. By the end of the Transcon, she didn’t carry so much as a gel in her pocket. Photo: Jay Lee. In fact, Sandy’s team of two was constantly aware of doing everything by the book. From redundant Garmin watches to the Inreach tracker, witness statements, photos and videos, crew chief/CPA Jay Lee made sure that the run was documented in copious detail. What is perhaps the most intriguing aspect of Sandy’s run is her utter ordinariness. As one LetsRun.com user observed (before Sandy proved him wrong), “You just can’t compare Sandra with a world-class runner like Pete Kostelnick,” the men’s Transcon record holder. Day 38, Iowa. Cruising alone through the sunset after a pleasant day running with the Camachi Cross-Country team. Photo: Jay Lee. 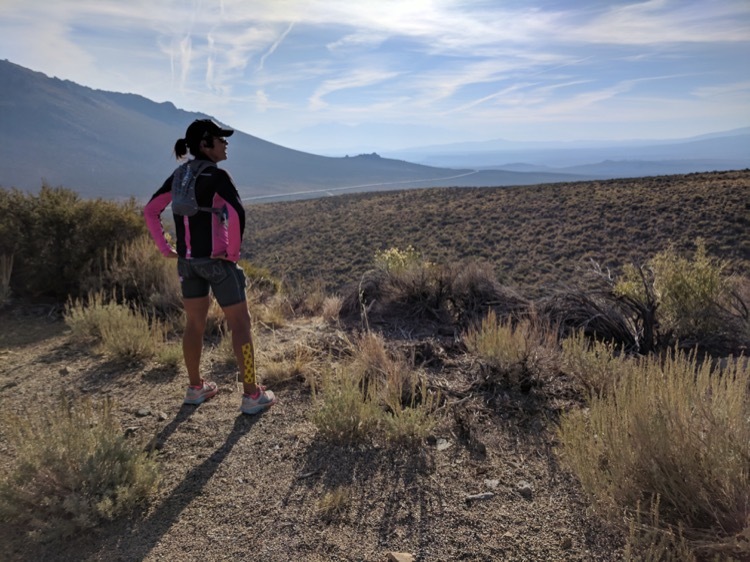 Imagine the face of her doctor when she went in for a physical after finishing the Transcon: “You’ve been doing WHAT for the last two months?” Amazingly, she is in fine shape, except an indefinable “skeleton ache,” a warning to not get back to running just yet. Her only other symptom is road nightmares, waking up feverish that she should be out on the road, clocking off more miles. Day 45, Iowa. Sandra is joined by St. Michael’s Defenders Cross-Country team, led by Coach Bryan Perkins. Although Sandy didn’t know it at the time, Perkins’ mother had died on that date, in the line of duty as a firefighter. Perkins was remembering his mother and running with Sandy was a connection to the strength of his mom. He left a beautiful letter for Sandy. Photo: Jay Lee. In Sandy’s case, the goal was rather anti-climactic. She arrived in New York City in the middle of the night preceding the New York City Marathon, needing to finish before crowds filled the streets. Guinness regulations require a Transcon to finish on City Hall steps, but since New York locks the gates around City Hall over the weekend, an unhappy security guard granted her access to the steps just long enough to secure the finish. At City Hall, she was spared the gruel of microphones thrust in her face, because, well, there weren’t any microphones. And no cameras to record that, after travelling 3,127 miles without a single fall, she tripped getting up into the RV for the last time. Eight hours later and five miles away, Shalane Flanagan made headlines as the first American woman to win the New York City Marathon in 40 years. The media missed a helluva great story: Sandy and Shalane, American women breaking records of 40 years’ duration, a celebration of drive and hard work, inspiring young runners with big dreams. But that’s ultrarunning. Even the best of our elites do not get much attention. Nevertheless, the deed is done: Sandra Villines ran across the country and set a new record. And now others will be tilting at that record. Pam Reed, legendary in ultrarunning, is preparing for a February start on the southern route, trying to beat Sandra’s record of 54:16:24. Day 52, Pennsylvania. A typical crewing transaction. The Toyota Yaris is parked way back on the road. Crewman Jay Lee has run forward with Huma gels, banana, electrolytes, tissue, anticipating what Sandy might need. Afterwards, Jay would run back to the car and drive forward to do it all again, about 100 times per day. Photo: Larry Grogin. Ultrarunning may be the ultimate in solitary sports, but it’s also highly communal. Sandy’s record is a triumph for us all, media hype or not, because pushing limits is what we’re about. We all register for journeys that may be too much for us, then we throw ourselves into the unknown to see if we can make it. It’s that willing detachment from certainty that defines us as ultrarunners. Sandy has given us a fresh picture of that detachment, in her minimal (even skeletal) crew, her budget-minded preparations ($1.50 rain ponchos) and her graceful acceptance of crickets at the finish. She shows us that simple desire and determination are enough to get the job done. That’s a good vision. Tell the young people. Jay Lee was Sandra Villines’ one-man road crew for 54 days, navigating, monitoring safety and weather, and supplying nutrition and hydration. On an average day, he got in and out of the car over 100 times. These aren’t the ordinary logistics of crewing an ultra, but after this Olympics of crewing, surely the Wingman has some suggestions for the rest of us? 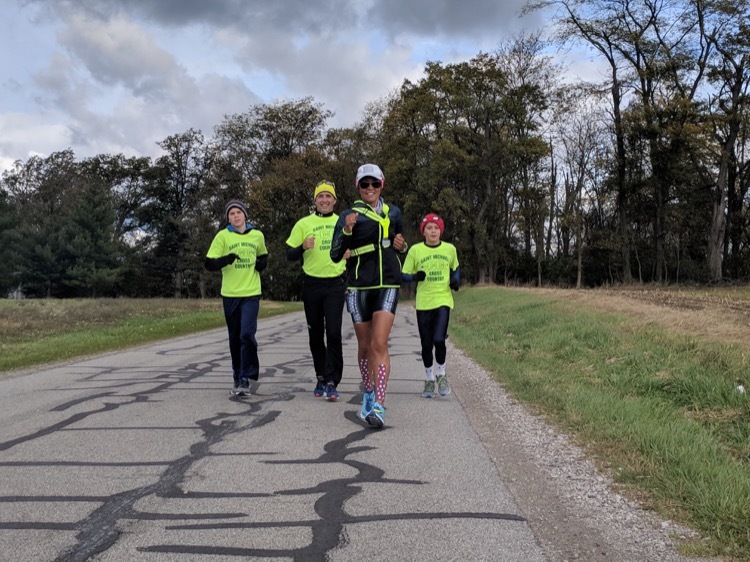 “Sherpa training.” Doing long runs with your runner gives the crew member a better read on the runner’s moods, to better provide encouragement when the runner goes silent or dark. 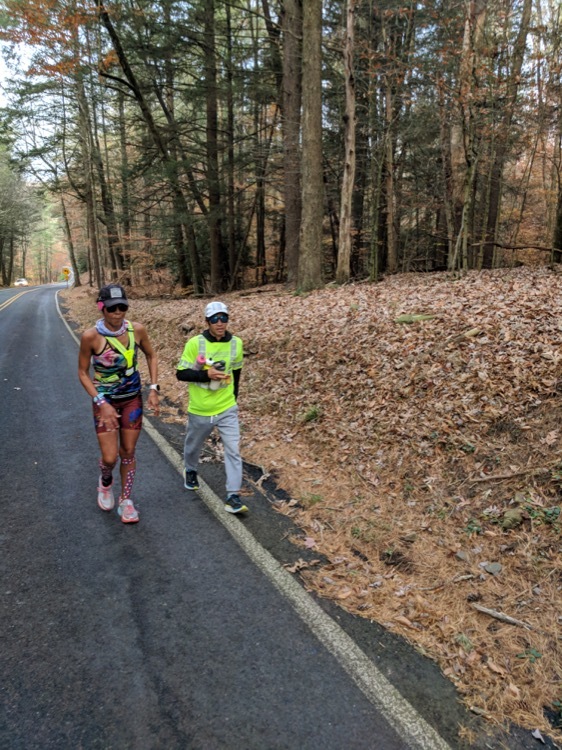 Every long ultra has a dark period of self-doubt, when the runner asks, “Why am I doing this?” and concludes, “I don’t know.” A good wingman knows how to accompany the runner in the dark (figuratively as well as literally). Be adaptable; don’t freak over the unexpected. When Sandy and Jay encountered a bear in Yosemite, Jay handed Sandy his cowbell and then drove ahead of her, honking the car horn, with her clamorously following. Be aware of the runner’s intake of fluids and calories. During the first 40 days of the Transcon, Jay kept detailed records of everything Sandy ate and drank. The data helped them adapt to the most advantageous intervals for her. Put your own health and safety first. No one else has time. Try to anticipate the conditions the runner encounters, so you’re ready with the proper gear. Jay drove the crew car most of the way to New York with the windows wide open, getting as wet, cold or sweaty, as Sandy. OK, that’s a bit extreme, but be attentive to weather conditions. Be fit for the distance. Jay was at the peak of training for Marine Corp Marathon when the Transcon began. Otherwise he could not have kept up with Sandy. The crew stops alone added up to around 300 miles. Make it your personal goal to help your runner achieve their goal. Be the best wingman ever. Sheryl Collmer runs and writes in Plano, Texas. Extremely motivating. As someone leaving March 18, 2018 on a very similar route, east to west, her effort was simply amazing. 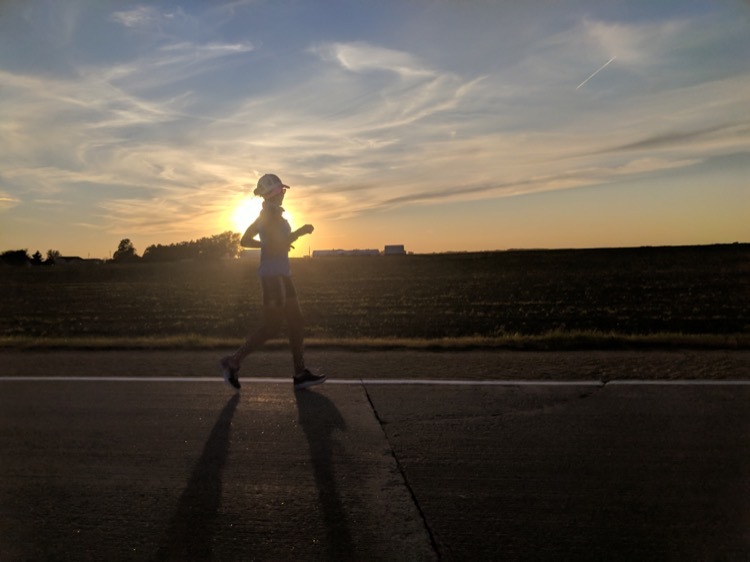 I plan to go a lot slower to raise money to prevent and treat child abuse as https://run2heal.org and the experiences captured in the article give me goosebumps. Congratulations, Sandy V. The women in our UR community never cease to amaze me.